Dear Applicants, Garden Reach Shipbuilders & Engineers Limited is inviting online application form for appointing candidates on 261 Trade/Graduate/ Technician Apprentice Vacancies. All the applicants who are interested n GRSE Recruitment 2017 – 18 can apply online form for apprentice vacancies. Online registration for GRSE Apprentice Vacancy 2017 has been started from 07.12.2017. You can applying online form till the last date, that is 27.12.2017. GRSE Kolkata has issued notification for recruiting candidates on Various Apprentice Vacancies. This is great job opportunity for all candidates who have hold ITI/Diploma/Graduation Degree in Various Trades. 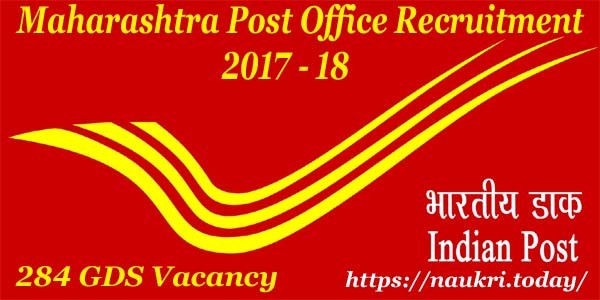 Those candidates who are going to fill online form for GRSE Vacancies 2017 – 18 should check post wise required Qualification & Other details from here. Our naukri.today team is providing full details about Education, Age & Selection criteria for GRSE Kolkata Jobs in the below article. What is the Important Dates For Filling GRSE Jobs Online form ? How Much Application Fees For Filling Online form for GRSE Vacancies ? How I Apply Online Application For GRSE Recruitment 2016 ? Candidates can check post wise required Education & age Criteria For GRSE Apprentice 2017 Jobs from here. In the below section full details about Eligibility Criteria is described. You can also get this details from official Garden Reach Shipbuilders & Engineers Limited Jobs Notification. Trade apprentice (Ex ITI) : Applicants must have passed All India Trade Test for Craftsmen Training Scheme or National Trade Certificate issued by NCVT for this vacancies. Apprentice (Fresher) : Candidates must have passed Matriculation (10th) from any recognized Board for GRSE Apprentice Jobs. Graduate Apprentice : Hold Degree in respective engineering Trade. Technician Apprentice : Diploma in relevant Trade is required for filling GRSE Vacancies Online form. More information you can collect from official Garden reach Shipbuilders Jobs Notification. GRSE Trade Apprentice Jobs (Ex ITI) : Age must be in between 14 years to 26 years as on 0101.2018. Trade Apprentice (Fresher) : Minimum age 20 years & maximum age 20 years. Graduate & Technician Apprentice : Candidates age should be in between 14 to 26 years. There is no need to pay any application fees for filling online form for GRSE Recruitment 2017. More details about Exam Fees you can check from official notification. Candidates can check post wise & Year wise stipend for GRSE Apprentice Vacancies from here. Check Per month stipend which is mention below. Selection of the candidates for Garden Reach Shipbuilders & engineers Limited Vacancies will made on the basis of Qualification. Final merit list will prepare on the basis of marks Obtain in Qualification. 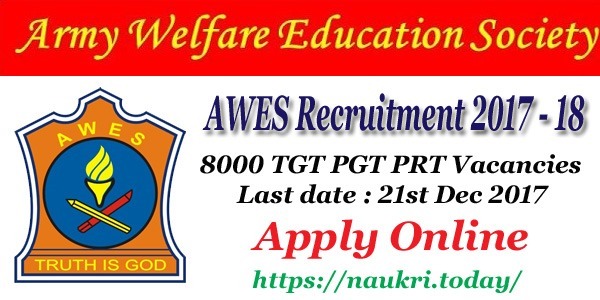 To get full details about Selection Criteria for GRSE Recruitment then check the official advertisement. Candidates log on to the official website www.grse.nic.in. Now click on Career Section & Click on Official GRSE Vacancy Notification. Read all the information from notification properly. Click on Apply Online form link. Make all the details in form without any mistake. Upload your scanned photo & signature in form properly. Recheck all filled details in form before submission. Now deposit application fee & click on submit button of GRSE Jobs Online form. Take print out of application form for future use. Conclusion : – GRSE Recruitment 2017 – 18 For 261 Apprentice Vacancies. 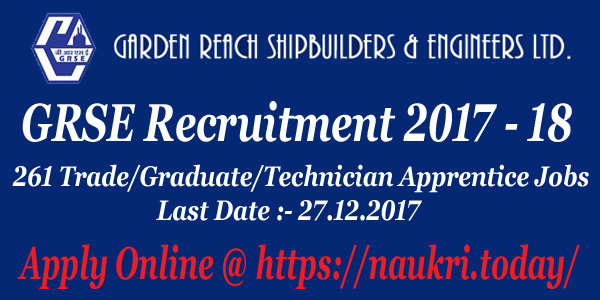 Applicants who are eligible for Garden Reach Shipbuilders Vacancies can fill online form here before the last date 27.12.2017. Check more information by using Official Notification. Garden Reach Shipbuilders & Engineers Limited (GRSE) has published advertisement for recruitment of Trade Apprentice Post. Candidates who are looking for GRSE Apprentice Vacancy should apply online application before closing date. For more details like Age Limit, Education Qualification etc. you can check given below details. For Ex ITI Candidates : Candidates should have passed All India Trade Test (AITT) for craftsman Training Scheme & NTC Certificate for GRSE Trade Apprentice Vacancy 2016. For Fresher Candidate : Applicants must have done Matriculation/ Madhyamik or equivalent qualification for Trade Apprentice Vacancy In Garden Reach Shipbuilder. Garden Reach Shipbuilder Vacancy Age Limit : Minimum age of the candidates for GRSE Recruitment 2016 should be 14 years. Maximum age should be 25 year for Ex ITI Candidates & 20 years for Fresher Candidates. Age relaxation will be applicable as per Department Norms for GRSE Trade apprentice Jobs 2016. GRSE Kolkata Apprentice Vacancy Application Fee : There is no need to pay any application fee for GRSE Apprentice Recruitment 2016. Pay Scale for Kolkata GRSE Vacancy : Candidates will be paid pay band for GRSE Apprentice Vacancy as per Apprentice Act 1961. GRSE Trade Apprentice Jobs 2016 Selection Process : Selection of the candidates for GRSE Recruitment 2016 will be on the basis of Merit List. Merit list will be prepared on Marks Obtain in ITI Examination. Candidates can apply online application for Garden Reach Shipbuilders Apprentice Vacancy 2016 before the last date. Follow the given instruction for applying online form. Applicants can log on to the official website. After that click on official GRSE Notification link. Read all the instruction from notification properly. If you are eligible than click on apply online link. Fill all the details carefully in form without any error. Upload scanned photo & Signature in form in form carefully. Send the hard copy of application on postal address. Garden Reach Shipbuilders GRSE Recruitment 2016 for 181 Trade Apprentice Vacancy. Apply online application for GRSE Apprentice Vacancy 2016 before the last date 20.10.2016.